He’s the sort of actor who can do Hamlet and Charlie’s Angels in the same year. He shuns managers and agents and once agreed to voice the part of Garfield because he mistakenly believed it was a Coen brothers film. Bill Murray’s extraordinary career is rich with fascinating anecdotes, contradictions, and mystery, from his early success on Saturday Night Live and the biggest blockbusters of the 1980s (Caddyshack, Stripes, Tootsie, Ghostbusters) to his reinvention as a hipster icon in the early 21st century (in films like Lost in Translation and Moonrise Kingdom). 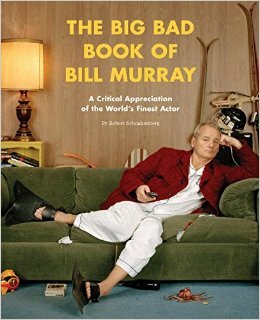 And now you can get your fill of Bill: part biography, part critical appreciation, part love letter, and all fun, The Big Bad Book of Bill Murray chronicles every single Murray performance in loving detail, relating all the milestones, yarns, and controversy in the life of this beloved but enigmatic performer. These pages are packed with color film stills and behind-the-scenes photography. I knew who Bill Murray was. I'm not a huge fan though, but did enjoy a few of his movies, like Stripes. After reading this book though, I'm a bigger fan than ever. This book goes through the A to Z life of Bill Murray. From his personal life, which he loves to keep very personal, to his movies and tv stints. This book really has it all and gives you deeper insight into who Bill Murray, the man, is. Not just the actor. Bill Murray is such a unique person. I read recently on the net, after a Grateful Dead concert... yeah, you read that right... people could see Bill Murray cleaning up around the stadium afterwards. I've not heard of another celebrity ever helping out like that before. To think, this was not a first for him either. He does this kind of stuff all the time. I may not have been a huge fan before, but I sure am now. Anyone who doesn't know much about him, is a huge fan, or if you just enjoy books about celebrities, grab this one. It was a great and insightful look at him and his life. Awesome! I won a copy of this in one of the ABEA giveaways, but I haven't had a chance to read it yet. Glad to hear you enjoyed it! 1. Did Bill contribute to the content of this book? 2. I LOVE BILL MURRAY! 3. When people tell me "oh, you can't do it that way, you'll never be successful", I always think of all the other people that they told that too and they were wrong about. Bill Murray is one of those people. Thanks for sharing. I'll definitely be putting this on my "Must read" list. He did contribute via quotes and interview content, but did not write any of it. It's nice when a star is revealed to be a good person too. Sounds like an good read. I've never been a huge fan, but I can imagine a book like this would create one out of me, too. It sounds like a book I would very much enjoy! I'm a fan and think he is a wonderful and talented actor.